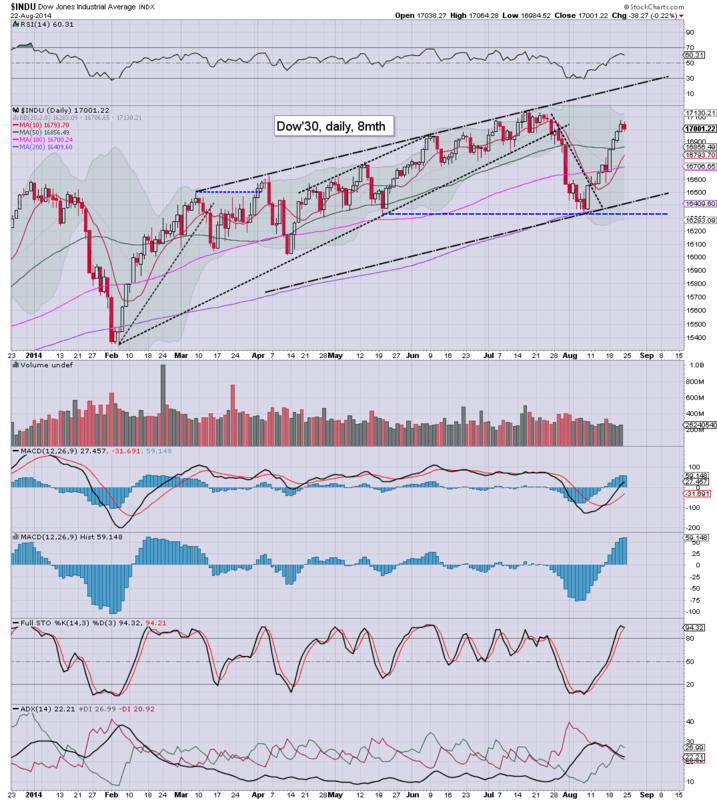 The US equity indexes continued to climb, with net weekly gains ranging from 1.4% (NYSE Comp') to 2.0% (Dow, Trans). Near term outlook offers the sp'2010/20s, with 2030/50 zone by late September. The big unknown is whether bears will show up in October. 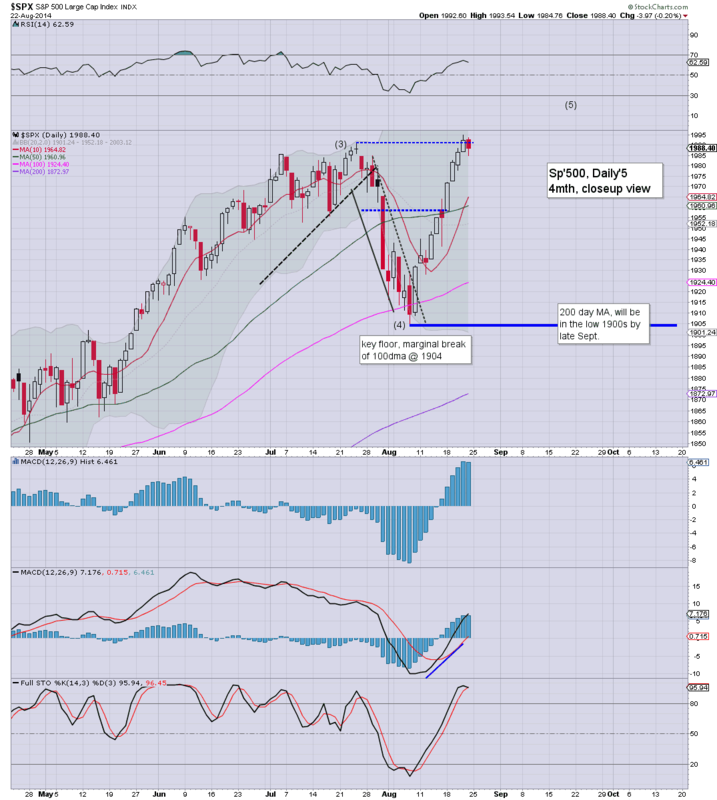 The sp'500 gained for the third consecutive week, 33pts (1.7%). A new historic high of 1994 was attained. The giant 2000 threshold still looks due in the immediate term. Underlying MACD (blue bar histogram) cycle is still negative, but is set to turn positive within the next week or two. Certainly, bulls look in full control, with viable upside to the 2030/50 zone by mid September. By late September, the core primary rising support will be around sp'1950. A break of that would open up a test of the Aug'7th floor of 1904. On any basis, equity bears seeking a multi-month top need to break the 1900 threshold to have any confidence of lower levels into year end. 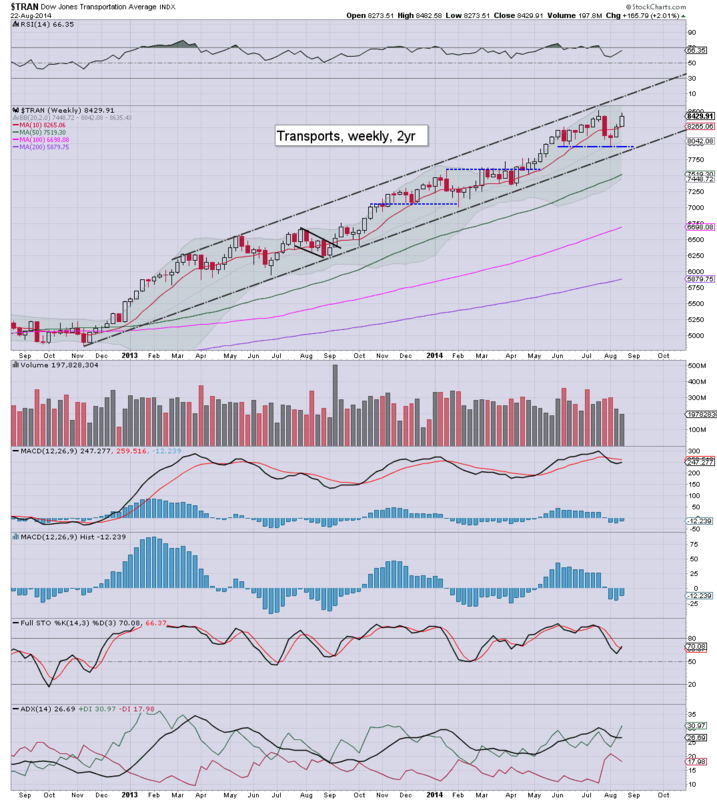 The tech' gained 1.6%, and looks set for the 4600/700s in September. 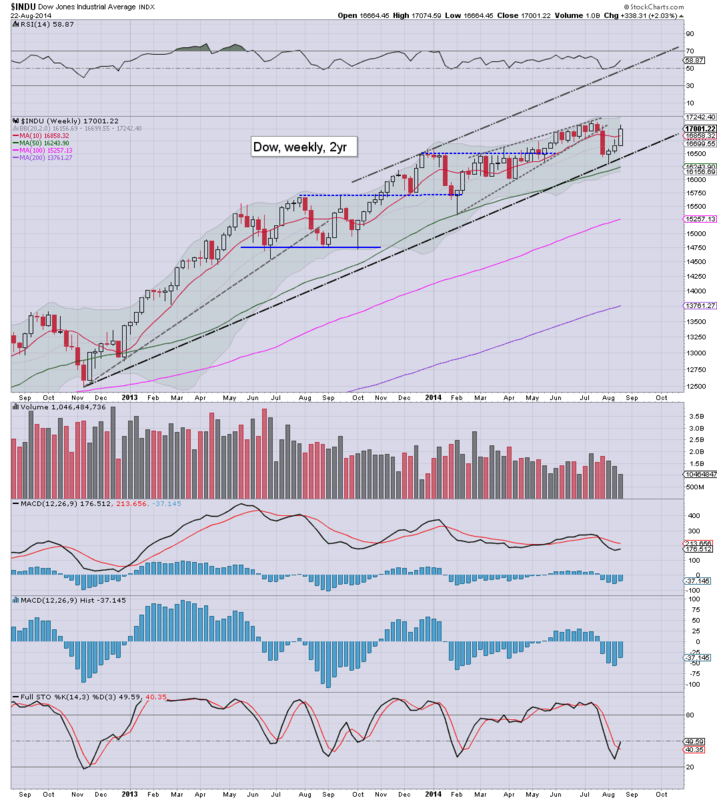 The giant 5000 level looks tough to reach in the remainder of this year, not least if we see some weakness in October. The mighty Dow climbed a very impressive 338pts (2.0%) this week, and looks set to break new historic highs within the next week or two. Upper bollinger on the weekly cycle offers 17300/400s in early September. 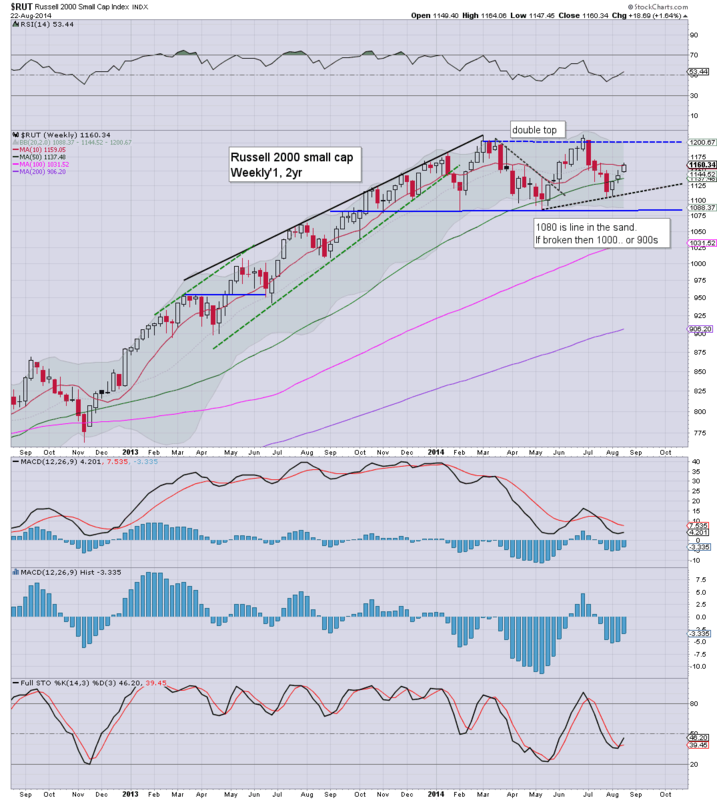 The master index climbed 1.4% this week, and managed a weekly close above the important 10MA. 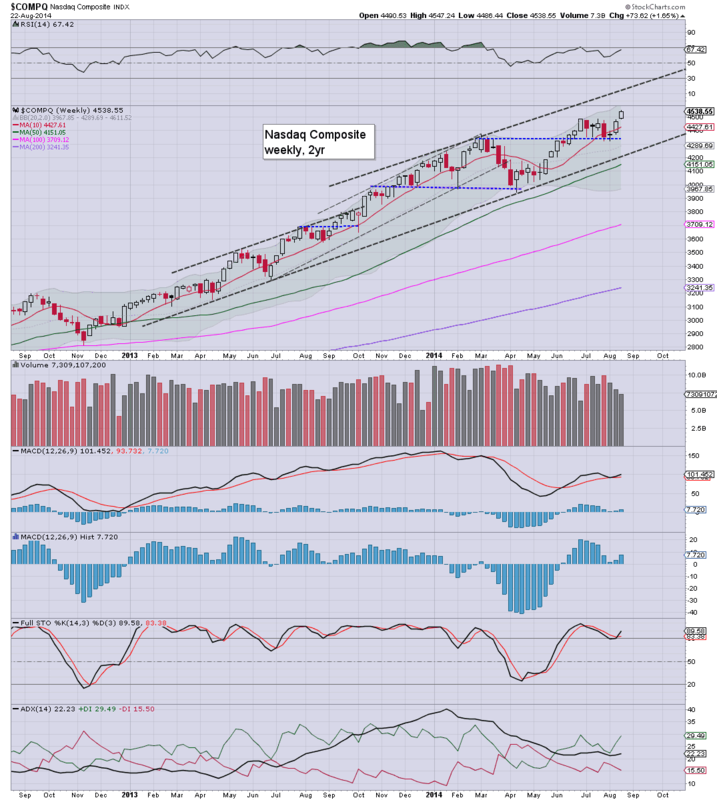 The 11000s look due next week, with viable upside to the 11300s by late September. 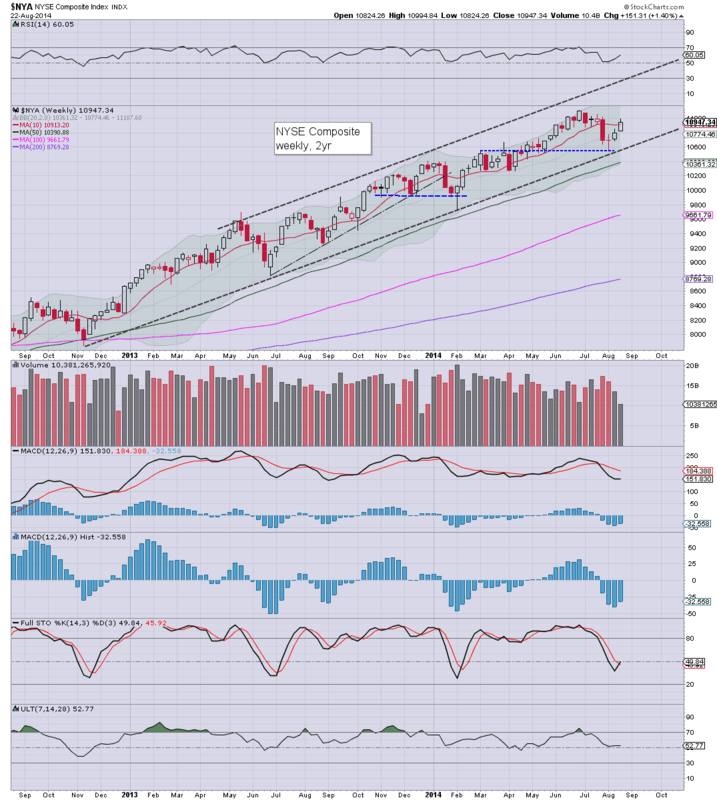 The second market leader managed a net weekly gain of 1.6%, with the first weekly closing above the 10MA in six weeks. Underlying MACD is still negative, but looks set for a bullish cross in the first week of September. There looks to be upside to 1190/1200, but new highs >1213 look difficult. The 'old leader' continues to lead, with a powerful 2.0% net weekly gain. 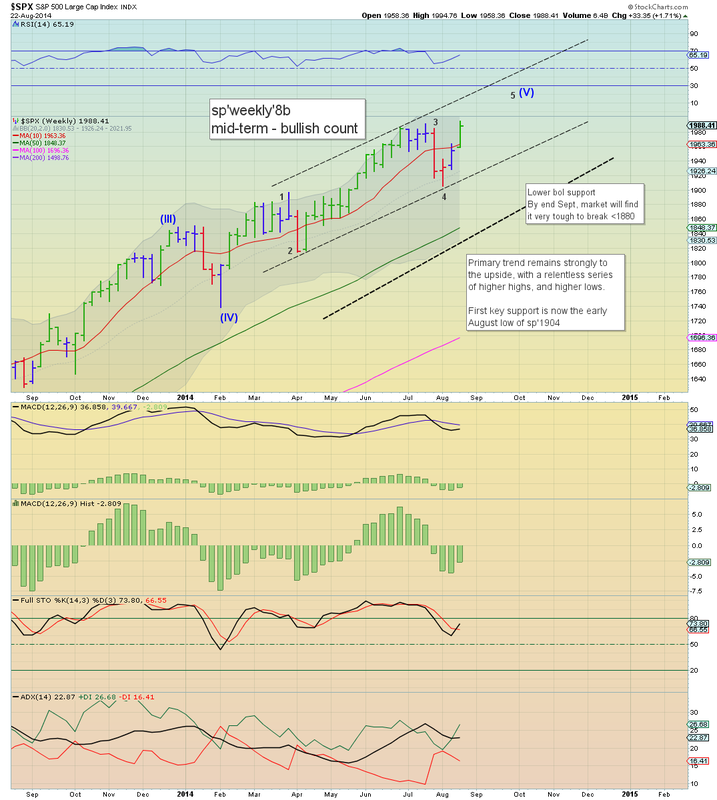 New historic highs look due next week, with viable upside to the 8500/600s in September. A bullish cross is due shortly after Labor day. Unquestionably, a strong week for the equity market. Even the laggy R2K managed some reasonable gains. Based on previous cycles since 2011, the bulls should at least see another 2-3 weeks in their favour. Equity bears will probably have their next opportunity of a multi-week down wave in late September. There are a few bits and pieces across the week, but nothing particularly significant. Thur' GDP (second reading). A moderate downgrade is likely. Fri' Pers' income/outlays, Chicago PMI, consumer sentiment. Once the econ-data is out of the way, it will likely be a very quiet day as the following Monday is 'Labor day', when all US markets will be closed. *there is QE next Tuesday of $2-2.5bn, and $1bn on Wed'. I remain extremely cautious. I'm seeing the same underlying upward pressure that we've seen since the key floor in Oct'2011. We've seen a great many geo-political news stories across the past few years, and yes.. many such stories have rattled the market. Yet the declines were all relatively minor.. and very brief. 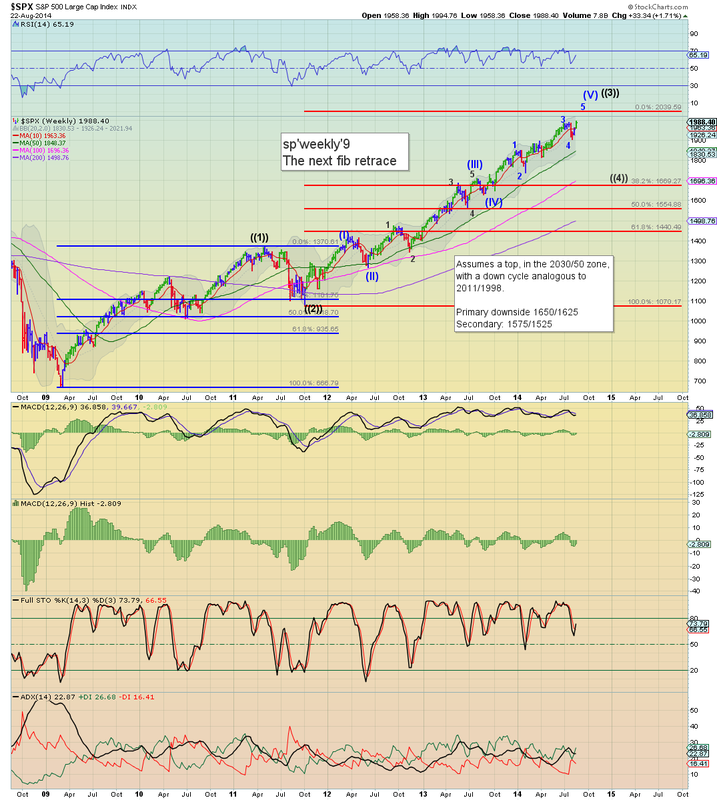 When will the grand wave from Oct'2011 complete? I see a fair few other chartists out there with broadly similar outlooks. If correct... bears should be seeking a major retrace... at least down to the 38% fib retrace in the mid 1600s. As ever.. one day at a time, but by mid/late September, having waited for more than a year.. I might finally try to short the indexes. Mr Market comfortably coped with the FOMC minutes and Yellen at Jackson hole this week. 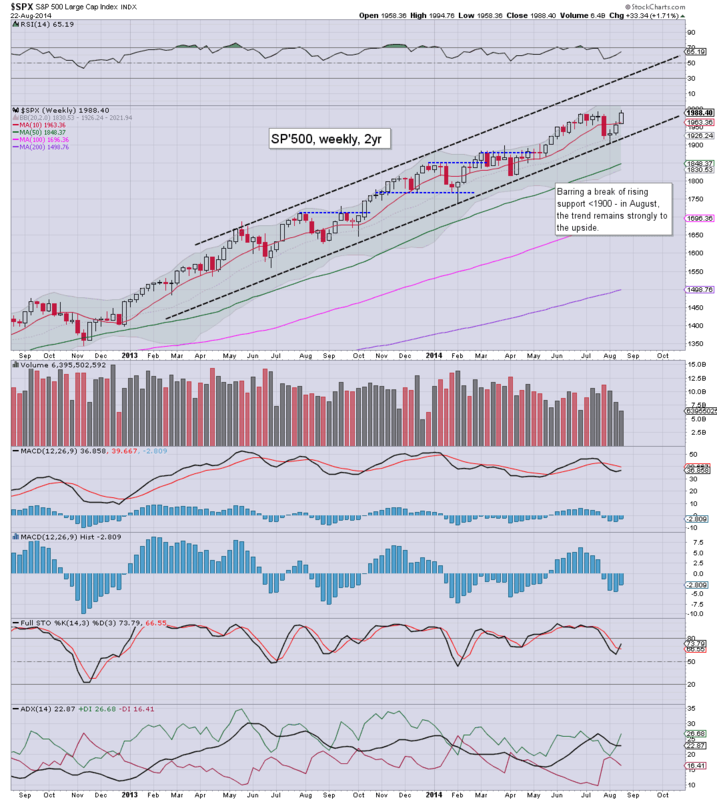 The sp'500 saw net weekly gains of a rather significant 33pts (1.7%), with a new historic high of 1994. Outlook into mid/late September remains 2030/50 zone. ..and that concludes another week in what remains a crazy and twisted market. The sp'1904 low is now far below... and it would seem unlikely to be tested until October...if at all this year. US indexes ended the week on a subdued note, sp -3pts @ 1988. The two leaders - Trans/R2K, both settled u/c. Near term outlook remains bullish, with the sp'2000s still likely, with broader upside to 2030/50 by late September. Unquestionably, another week for the equity bulls, with new historic highs in the sp'500. The Nasdaq Comp' managed a new post 2009 high. Underlying MACD (blue bar histogram) cycle remains powerfully bullish. It will take some days just to get a bearish cross. As things are, sp'2000s still look due...along with new highs in the Dow, Trans, and NYSE Comp'.